Fournissant des informations sur la structure de la matière à des échelles comprises entre le nanomètre et le micromètre, la ligne SWING permettra de répondre aux nombreuses questions liées à la matière molle, à la conformation de macromolécules en solution et aux matières composites en sciences des matériaux. Cette installation expérimentale permettra d'effectuer simultanément des mesures de diffusion de rayons X aux petits angles (SAXS) et grands angles (WAXS) dans la gamme d'énergie de 5-16 keV aussi bien que des mesures de diffusion en incidence rasante (GISAXS). Des expériences de diffusion anomale seront également possibles. L'accent sera mis sur la variété d'échantillons qui peuvent être étudiés, solutions, gels, solides amorphes, solides cristallisés et sur la diversité des environnements correspondants. @umr8226 Happy you had great Beamtime! SWING est une ligne de lumière de SOLEIL principalement dédiée à la biologie et à l'étude de la matière molle comme les gels, les plastiques ou les colles. La ligne utilise le rayonnement synchrotron dans le domaine des rayons X. - 0.20 / + 0. 20 m (horiz), -0.20 / +0.20 (vert), 0.5 m / +6 m (along X-rays). Dedicated sample environments have been developed to provide scientific communities with optimized experimental conditions. 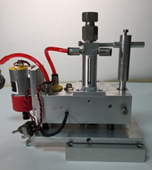 For soft-condensed matter, numerous devices are available (home-made capillaries holders, Linkam THMS600, Anton Paar rheometer with custom-made Couette cells …). 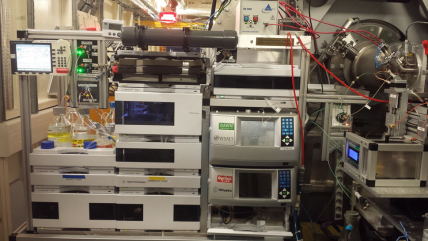 For structural biology, a unique SEC-SAXS HPLC system is routinely used for online purification connected to a quartz capillary placed under vacuum cell. Here are presented the most used devices for both soft-condensed matter and structural biology. Two independent circuits of purification (can connect two columns with 2 different buffers). Combination of the SEC-SAXS system with MALS and RI is now available at user request. Sample every 2.5 min (pipetting, injection, measurement, cleaning and drying). The sample is drawn in the capillary only and at the required height. After X-ray exposition, it’s reinjected into the mixing cell. We use Agilent standards vials and inserts for the HPLC device and the Auto Sampler. We lend you the vials and the caps but you have to buy you own inserts (Agilent reference: 5181-1270). In any case, we can give some used inserts that you can wash and dry. The minimum quantity of buffer is 40ml for one injection (10mL of system purge + 20 mL of column equilibration + 10mL of elution). We will recommande you to bring much more (100mL to 500mL) to obtain a better equilibration of the column and to induce less stress in case of trouble. To make your backups directly on the line, a Windows compatible hard disk is required. However, you can still download all your data a posteriori via the sunset[Experiment Data][Soleil Data Retrivial]. The biology laboratory (link) provides support to users for the preparation of their experiments. For any question, please ask the laboratory staff. The session includes beamline set up installation. It’s recommended to discuss with your local contact before coming to the beamline to save time during installation. Our GUI (passerelle) allows automatic data collections of multiples simple in a row. For direct data monitoring and security check, an others GUI (Cook) is installed. The local contact will show you how to use these GUI. All the images produced on the Swing beamline can be process by homemade software (Foxtrot) in collaboration with Xenocs. You can ask for it by email to Xenocs by mail. You can find here (new link) a tutorial for processing SEC-SAXS experiments. For SEC-SAXS and BioSaxs AutoSampler, an automatic workflow for data analysis is available. This workflow takes raw images as input files and sends all results curves into IspyB database. Furthermore all intermediates files are available for users and could be reloading in our Foxtrot application. We have a living area where you can use coffee machine, Sofa, fridge for food and beverages, micro wave and table. Wifi is available using your sunset login and password or using Eduroam network. This area is sample free and please clean it after your session. Please don’t forget to fill the end of report in the sunset webpage. All your datas are available using the Soleil data Retrieval via the sunset web page. Our GUI (passerelle) allows an “on demand” complex data collections strategies. For most of the sample environment, a workflow is already written. For direct data monitoring and security check, an others GUI (Cook) is installed. The local contact will show you how to use these GUI. 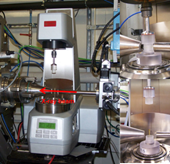 All the images produced on the Swing beamline can be process by homemade software in collaboration with Xenocs. You can ask for it by email to Xenocs (link). We have a living area where you have coffee machine, Sofa, fridge for food and beverages, micro wave and table. Wifi is available using your sunset login and password or using Eduroam network. This area is sample free and please cleans it after your session. Listes des logiciels développés par la ligne SWING. A zip archive containing executables for Mac, Linux and Windows together with a test example may be downloaded by clicking here. ... a program for the ab initio “dummy-atom” structural modeling of Biological Macromolecules including the contribution of their inherent hydration layer. DENFERT is implementing a simulated annealing algorithm similar to DAMMIN program by D. Svergun (Biophys. J. 76, 2879-2886) for the restoration of low-resolution structural info of bio-molecules from SAXS and SANS data. The major advantage of DENFERT is that the hydration layer around bio-molecules is taken into account by introducing a second type of beads (hydration beads) in the model. In the top figure, we see an example of the shape restoration of Lysozyme from SAXS data using DENFERT. A cartoon representation of the crystallographic structure is also presented for comparison. The bottom figure depicts additionally the hydration layer around the reconstructed protein shape. DADIMODO is a program for refining atomic models of multidomain proteins or complexes against small-angle X-ray scattering data. Domain structures are mainly kept rigid and can be user defined. Stepwise generic conformational changes are applied cyclically in a stochastic optimization algorithm that performs a search in the protein conformation space. The algorithmic structure guarantees that a physically acceptable full atomic model of the structure is present at all stages of the optimization. To prepare your complete pdb files, you can use our pre dadimodo script (3.71 Ko)(remove the _.txt extension).